This is my new wallpaper and I hope you like it. The character was vectorized, trying to be as faithful to the scan. For background use some brushes in the clouds, trees, leaves, etc. Everything was done with Photoshop CS5 and lines and details with EasyPaintToolSai. From already thank you for the favs and comments! Browse Fate/Zero Gallery: Recent | Popular. The vector of Saber could use some tweaks, especially around her hair since some parts of it look a bit too...choppy and jagged in places. Other than that, I love the clouds and that lighting is perfect! It's like that in the original scan but I love it when people still get it right in their wallpapers since it's very important, so kudos for that. Keep it up. 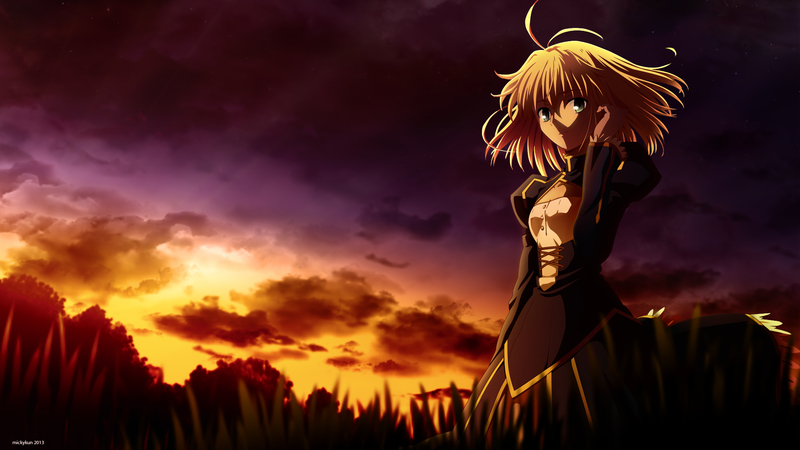 Lovely sky, lovely lighting and such a lovely Saber. I'll add this lovely wall to my +FAVs. De no mejorar la descripción, tu wallpaper será borrado. La descripción debe ser en inglés.